If you are a new parent who is always on the move with your little one(s), a baby travel system is something that will simplify your life. This invaluable piece of equipment offers a unique solution that allows you to keep your baby or toddler safe as you are traveling by road and comfortable when you are out-and-about on foot. What Is A Baby Travel System And Why Buy One? What Are The Different Types Of Travel Systems? How Much Should You Pay For a Travel System? Ickle Bubba is a brand that prides itself on understanding the needs of new parents. One way this brand has done just that is through their award-winning Ickle Bubba Stomp v3 Travel System for infants. Stylish, lightweight, super comfortable for your baby, foldable, and feature packed (including iSofix base and separate car seat, carrycot & pushchair seat units, plus a host of accessories). The Stomp v3 literally has it all. Therefore, if you find the idea of a travel system that does not compromise on anything, then this model is worth considering. The Stomps’ capacious storage basket will carry all of your essentials while on the move. Designed to hit the ground running, the Stomp v3 offers both style and substance in its frame. It is made of a lightweight, top quality aluminium that is a pleasure to carry and push around. The wheels are a hardwearing PU rubber and feature a mix of 30cm wide chunky rear wheels that add stability and smaller 17cm front wheels with 360° swivel for easy maneuverability. All 4 wheels are fitted with a suspension that will swallow up any bumps along the way. A few more nice touches to the frame include a leather look material that zips over the foam handlebar and large storage basket with a unique design that is wide, deep, and accessible from both the back and the front of the chassis. In between the rear wheels sits the unit’s brake, which consists of a thin bar that you push down to stop the travel system and flip back up again to continue with your journey. With the inclusion of a car seat and base in a unit that falls into the budget category, it is hard not to love the Ickle Bubba Stomp v3. In fact, this is one of the reasons why the travel system won the MadeForMums silver award in the under £500 category in 2017. And not just that, the car seat is expertly designed to match the high-quality build of the rest of the unit. The Galaxy car seat features a thick double-layered side impact protection and a soft newborn insert for extra safety whilst traveling. The Galaxy car seat features thick double-layered side impact protection, a nice soft newborn insert, and a 3-point harness you can use to install the seat directly onto the car’s seat belt. The other alternative is to place the Galaxy car seat over the included iSofix base. The base goes flat on your vehicle’s seat and has an extendable support leg with buttons for adjusting the unit onto the iSofix anchors in your car. 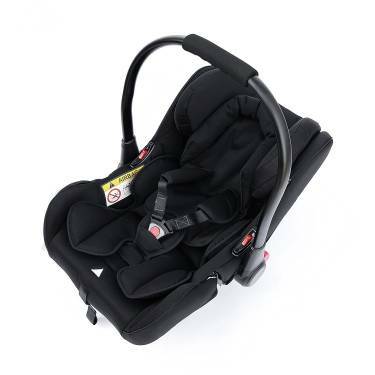 More features on the car seat include a bumper bar with the same leather cover as the handlebar, zip-on hood in a lovely lycra material that stretches out all the way to the bumper bar for the best sun coverage, foot warmer, and a bonus of 2 window sun visors! The car seat can be adjusted over 5 headrest positions (via a button at the back of the seat) to give your baby the most comfortable resting position even as he or she grows. Another reason why the Stomp v3 is an award-winning travel system is that it comes with a carrycot and a separate seat unit for the pushchair. The carrycot is suitable from birth to 6 months while the seat unit takes over after your baby reaches 6 months and can be used up until age 3. The carrycot is not the best designed or deepest around but it does feature an apron with side poppers for holding it in place, a mattress insert and a bit of padding. It also has 4 tiny wheels underneath that make it possible to set it down without risk of the carrycot tipping over or getting dirty. As for the seat unit, there are no complaints. A push-button at the rear of the seat makes it possible to adjust from one of 3 different positions. These include a seat-back height of 48cm with plenty of room for adjustment, as well as parent and forward facing positions that you simply set up by pulling back triggers at the side. The side release levers also make it easy to remove the infant cars seat from your pushchair base. In addition, the functional pushchair features comfy padding, a gate-opening bumper bar, 5-point harness with a single release button, and a hood. To top it up, Ickle Bubba throws in some thick seat insert & removable foot warmer, all in the same colour. 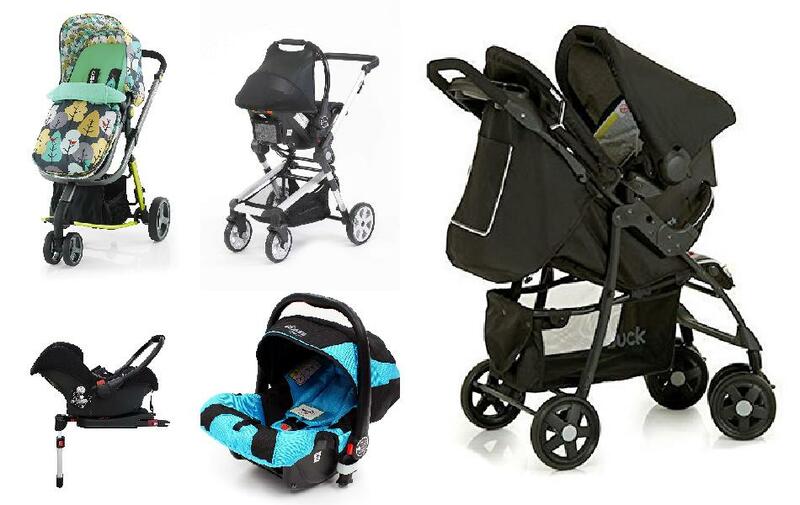 The Stomp v3 travel baby system from Ickle Bubba is not called a one-stop bundle for nothing. This brand has cleverly managed to combine the best parts of some of the top budget picks around in the Stomp v3. It has a stylish appeal that is in the same boat as the Hauck Disney Winnie the Pooh Tidytime and i-Safe Ocean Trio units. The travel system comes fully loaded with everything you will need – giving the likes of the Cosatto Giggle 2 and Beep Twist a run for their money. The Stomp v3 even comes with an iSOFIX base – a privilege shared with a chosen few units like the Ocean Trio. Overall, the Ickle Bubba Stomp v3 truly is an all-in-one infant travel system that not only offers great value for money but also reduces the need to purchase additional accessories. If you are looking for a travel system you can trust to keep you happy and your baby safe & comfortable, the Beep Twist unit by Baby Elegance should be one of your top contenders. With over 8 awards under its belt, this model punches well above its weight in the baby travel system ring. Find out if this travel system’s reputation is one you can trust with this in-depth buyers guide. The impressive dimensions of the Beep-Twists’ carry-cot means it can be used as moses basket. When it comes to the features of the Beep Twist, the carrycot is arguably the best. 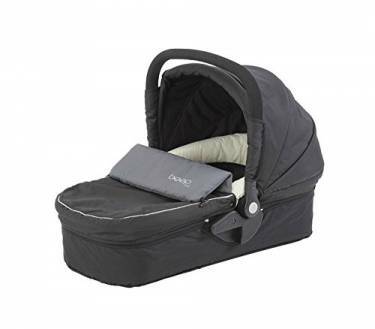 Measuring 76cm long by 32cm wide, the carrycot is very spacious and has a generous depth. These dimensions make it possible to use the carrycot as a Moses basket for your baby to sleep in overnight. You will, however, need to upgrade to a mattress with greater airflow to ensure utmost comfort during overnight use. On the interior, the carrycot includes a nice soft and thickly padded mattress, an apron that attaches via snapping poppers, and a padded strap that goes over the belly of your baby for the purpose of providing a more secure fit as well as keeping your little one from rolling around. The belt strap will be particularly useful as you navigate through the 3 different recline positions of your carrycot which range from completely flat to 2 slightly inclined angles that are great when you have a newborn with reflux or a slightly older baby who will enjoy watching the great outdoors. The carrycot exterior features a good sized hood with a patterned fabric as well as a big foam-padded carry handle that also adjusts through 3 different positions of upright, slightly down, and all the way down. 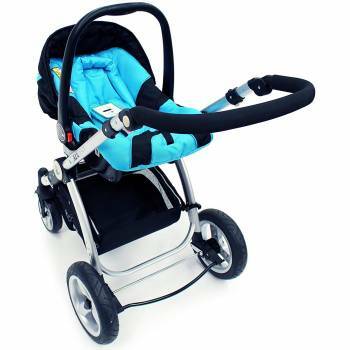 Another well-executed feature from Baby Elegance on their Beep Twist travel system is the frame’s folding mechanism. 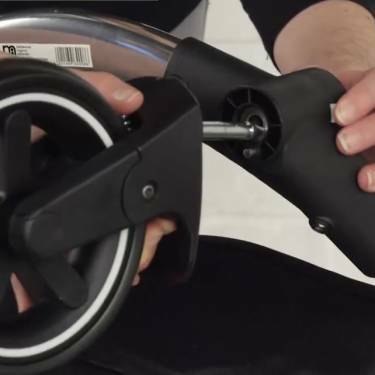 The unit offers an automatic 3D fold whereby you pull a trigger switch towards you and the rest of the unit (with included seat) easily collapses down to a compact fold. The switch is found on both sides of the frame. To unfold, you do things in reverse. Press a button to disengage the auto lock of fold mode, lift the handle, and then push down on footplate while giving the handle a good yank towards you to lock the chassis in open mode. You can also remove the seat unit, wheels, and bumper bar for a smaller and more flat fold if you have a particularly small car. The rear wheels have a centre release button while the front wheels feature a clip on the side for removal purposes. Aside from the spacious carrycot, the Beep Twist also comes with a group 0+/13kg car seat and pushchair seat unit. Both arrive already assembled and with everything you would expect from these 2 types of units. With the car seat, you get a newborn wedge, removable headrest, and height adjustable harness that has shoulder and buckle pads for extra comfort. The hood on the car seat is a black fabric and the handle is foam covered at the centre and adjustable over 3 height settings. The car seat also comes with the huge plus of a rocking base design that will come in handy when you want to put your baby to sleep. The seat unit is duo-directional (forward & back facing), can be used as early as age 3 months, and has several thoughtful touches from Baby Elegance. It is designed with 53cm of height and adjustable footrests – 2 features that enable the seat to grow with your child. The seat unit also comes with a zip-on headpiece for newborns and can be tilted back over 2 positions for comfortable sleeping when it is not in its 3rd upright position. The hood on the seat is not exceptionally large but it does have an attractive pattern on the inside and features peek through windows at the top and sides. Footmuffs, thick interior foam liners, 5-point harness with padding, and 3-positional bumper bar, are also included in the infant car seat’s design. When it comes down to it, the Beep Twist Travel System is just a seat base away from being perfect. Its build may not be suited for cobbled or crowded streets but it works exceptionally well for parents who value comfort over manoeuvrability. 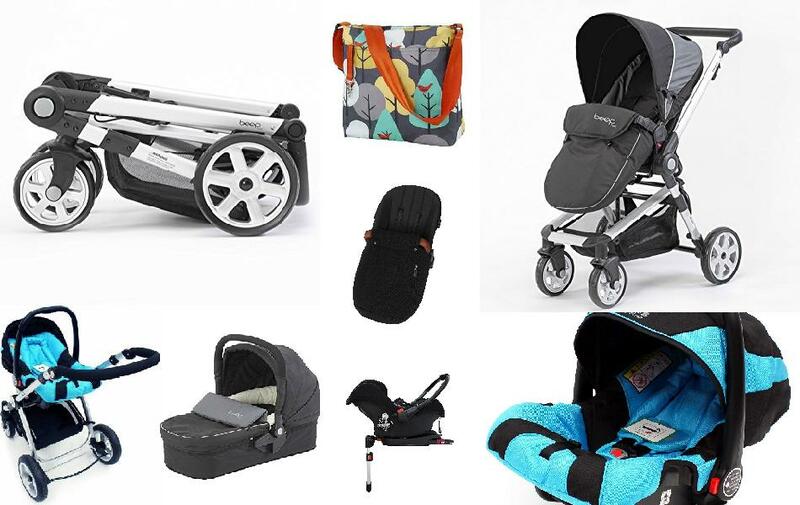 The unit’s design is appealing and you even get an extensive array of colour choices (black, aqua, pink, purple, denim, orange, cream, citrus, and more) for the frame, carrycot/seat unit, and car seat. 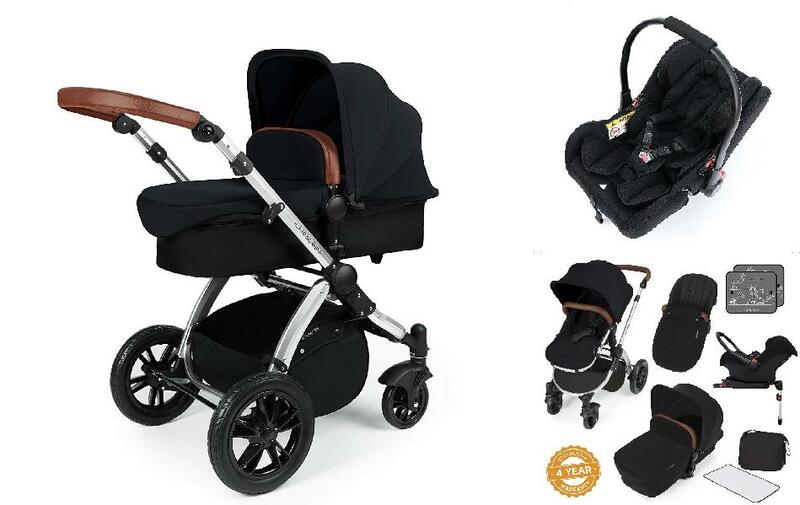 Baby Elegance truly kept to their company ethos of creating “fashionable and comfortable everyday essentials” when designing this Beep Twist baby travel system. 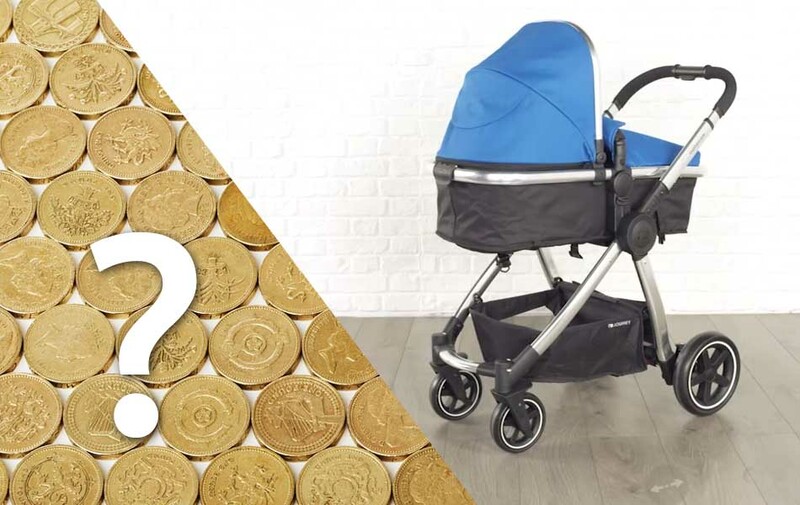 When it comes to travel system prices, the £300 to £500 range is considered the sweet spot where you will get premium quality units without breaking the bank. The Mothercare Journey Travel System is a perfect example of an infant travel system that strikes a good balance between cost and great workmanship. 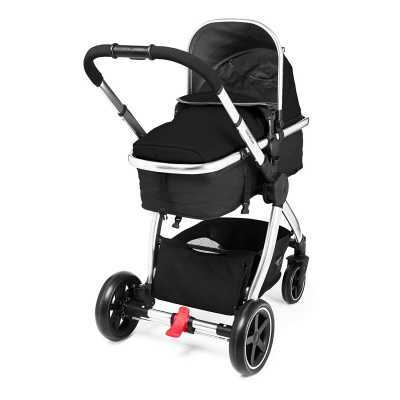 Sold at an affordable price of under £350 at the time of writing, this lovely black and chrome unit from Mothercare is a decent travel system that offers all the basics and more. Its stroller frame is sturdy but easy to push around, while the car seat is comfortable, supportive, and adjustable. 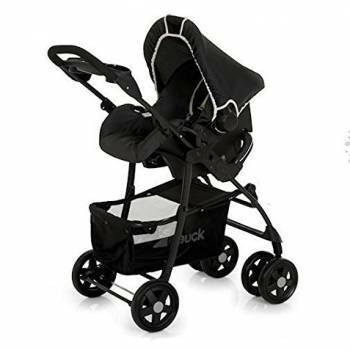 You also get a separate pram, storage basket, hood, plus a few more accessories you are sure to find useful. Continue reading to find out more about just what else this travel system offers. With this Mothercare travel system, you will not have to shop for adapters or other parts since the unit comes ready to use with everything included. All you need to do is put the travel system together. You can assemble it alone in less than 3 minutes. The unit comes with the frame folded, a car seat, pram, and separate wheels. To assemble the Journey you just need to pull the pushchairs’ handle to unfold frame and then attach the included 4 wheels by simply pushing them into place. After that, you can attach the pram or car seat, both of which click into place effortlessly. Like many infant travel systems, the ‘Journey’ model features a typical group 0+ car seat. As a result, it is suitable for your kids from birth until they reach 15 months of age or weigh 13kg – whichever comes first. However, unlike some car seats, which are only compatible with specific cars, the one on the Mothercare Journey is universal. So, it is compatible with most (if not all) brands of cars. Another plus for the car seat is that it features memory foam padding along with side-impact protection and removable wedge (infant insert) to keep newborns comfortable and properly supported while in the car. A convertible pram is also included with the Journey travel system for trips outside. It can be used in pram mode from birth to 6 months (9kg) and then adjusted to seat mode – which can take your baby to 15kg. 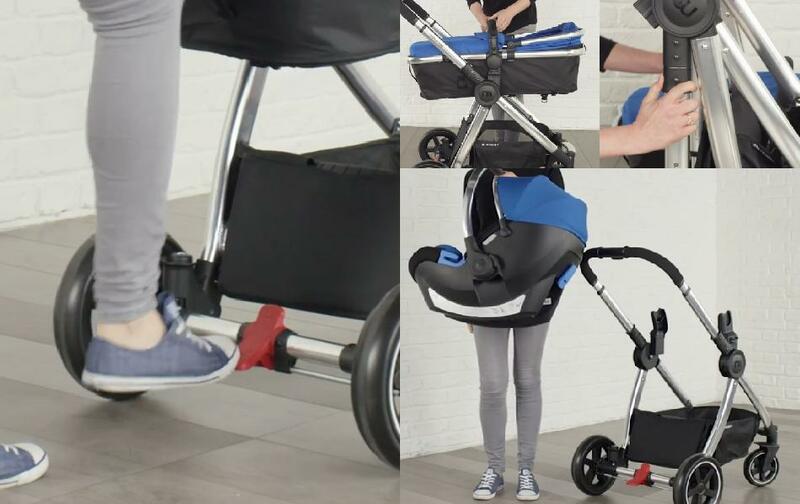 A height-adjustable handle makes it easy to carry the pram (which measures 800 x 350mm), while flexibility in design allows it to be installed in both forward and rearward-facing positions. This is the best part about the Mothercare Journey. It comes with a pram liner, apron, footmuff (dubbed cosytoe), and hood, all of which zip onto the pram unit. A tiny see-through window is fitted at the top of the hood allowing you to keep an eye on your little one when the pram/pushchair seat is facing away from you. For storage, you get a sizeable basket at the bottom of the unit, which can hold everything from shopping bags to clothes, to other baby essentials. Right next to the basket is a tiny magnetic pocket for storing smaller items like house/car keys, wallet, wipes, phone, and other valuables. Completing this range of amazing accessories is a removable bumper bar that keeps your baby securely in place and a rain cover that extends over the entire unit whether in pram or seat mode. Features a free-standing, sturdy pushchair frame that is easy to push, fold, carry and store in the boot (or even back seat) of your car. All adaptors and other attachment pieces remain within the pram & car seat ensuring you never lose track of them. The car seat can only be installed in a rearward-facing position and becomes useless when your baby reaches 13kilos. 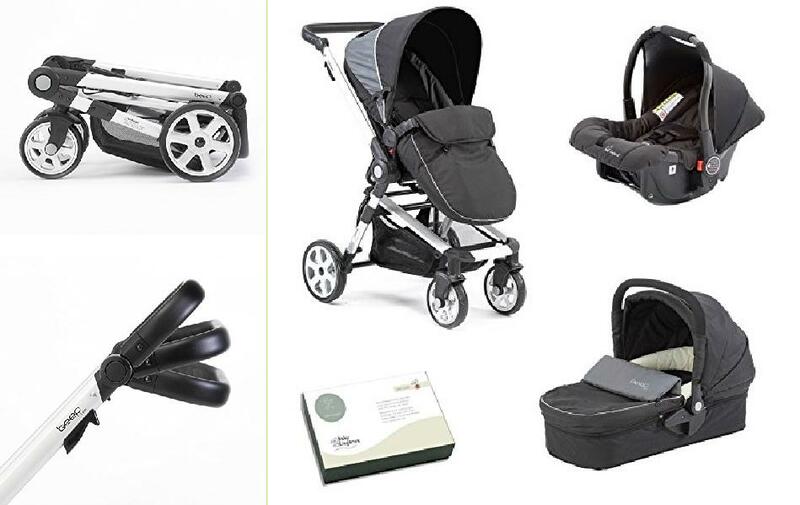 This Journey Travel System is affordable and comes with everything you will need for a day out with your baby – including a rain cover and quick folding & unfolding of the pushchair frame. It is just a shame that the included car seat will only get your baby to a little over age one. But, this is to be expected of travel systems in this price range. So, you will just have to settle with buying another car seat down the line if you choose this model. On the bright side, you can continue using the pushchair after your child outgrows the car seat. When it comes to luxury, not many units can beat the i-Safe System + iSOFIX Base – Ocean Trio Travel System. From its vibrant blue colour with a touch of black, & chrome, to the plush padded carrycot & seat unit, to a large expandable hood, this travel system offers unrivaled style and comfort in its build. Parents will also get a kick out of the Ocean Trio because it provides easy ways to do almost anything you need to with it; whether it is putting the unit together, folding it down after a fun day out, or attaching/removing the car seat, carrycot, and other accessory attachments. This guide will take you through the luxurious features of the Ocean Trio Travel System so that you can decide whether it right for you and your little one. Quality is not something you will have to worry about with the i-Safe Ocean Trio. 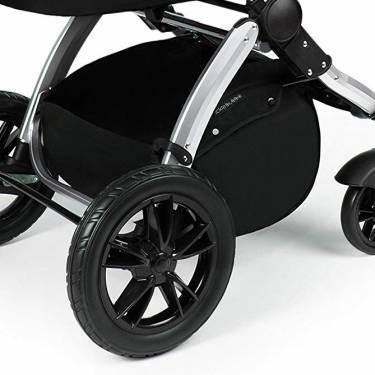 Featuring a 4-wheel build with an aluminium frame, full all round suspension, and large puncture-free wheels, this baby travel system is manufactured to the highest standards. So, your child will most likely outgrow the travel system before it suffers damage or malfunctions. Another upside to the frame is that it folds down easily, ensuring you do not waste precious time when taking the pushchair unit to storage. Simply press a safety button that is situated on one side of the frame and then pull on both sides until it collapses. Best of all, you do not even have to strip the frame beforehand because it can fold while the seat is in place. With the i-Safe Ocean Trio unit, you get a group 0+ high-quality luxury car seat as part of the package as well as an iSOFIX base. The small compact base anchors onto the back seat of your car easily. It also includes an additional tether leg structure at the bottom, which extends onto the floor of your car for a secure hold. The car seat comes complete with interior padding, side protection, large hood for protecting against adverse weather, and adjustable carry handle with 4 different positions. Adjustments are done by pressing buttons on either side and moving the handle to the desired position. Attaching the car seat onto the iSOFIX base couldn’t be any easier. You just have to place the seat over the base’s fittings and press down until you hear a click sound. A safety button will turn green to indicate that the car seat is safely in place. Lifting the car seat off the base is equally effortless and only requires you to pull a handle at the front of the base to un-click the seat. After that, you can simply lift off the seat and transfer it onto the awaiting pushchair, which has built-in adapters for simply pushing the car seat into place. Keeping up with its promise of luxury, the iSafe Ocean Trio comes with an impressive pushchair that doubles up as a carrycot and infant car seat. There is a clipper underneath the seat unit, which you will need to uninstall to switch between carrycot and seat mode. The seat reclines over 3 different positions and has quick release adaptors that allow you to transition from parent to forward facing positions in a snap. Aside from easy usability, the seat unit also offers comfort and safety in equal measure. It features a thick foot muff cover with zipper for easy attaching & detaching as well as a luxury-padded liner that slots into a 5-point harness safely tucked away into the unit. The harness is designed with shoulder and crotch padding and a centre button for quick and easy release. For ultimate weather protection, the seat unit features a separate bumper hood with quick release side buttons and a zipper that hooks it onto the seat. A zipper at the centre of the hood allows the weather shield to expand and offer more coverage when unlocked. It would be remiss to talk about the i-Safe Ocean Trio System without mentioning its one-of-a-kind storage basket. This black, spacious basket features a mesh zip-up cover that provides your belongings with some extra TLC. Thanks to the cover, anything placed inside the basket remains securely in place and fully protected from outside elements such as dirt, mud, and rain. The i-Safe Ocean Trio is a beautiful, comfortable, and functional travel system that will last through to your baby’s toddler years. It is also easy to push and practical, making it the perfect go-to unit for busy parents. So, if you are looking for a baby travel system that you can use on a regular or even daily basis, the Ocean Trio is for you. When shopping for a baby travel system on a budget, it is hard to come across a unit that gets a tick on quality, design, durability, and usability. 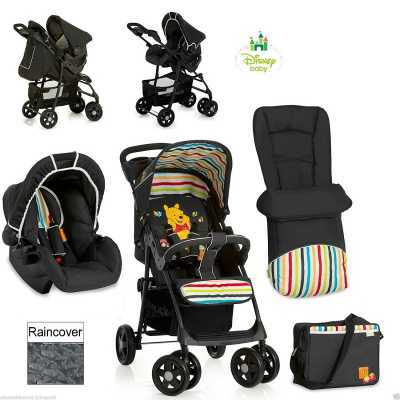 That is what makes the New Hauck Disney Winnie the Pooh Tidytime Travel System such a great buy. 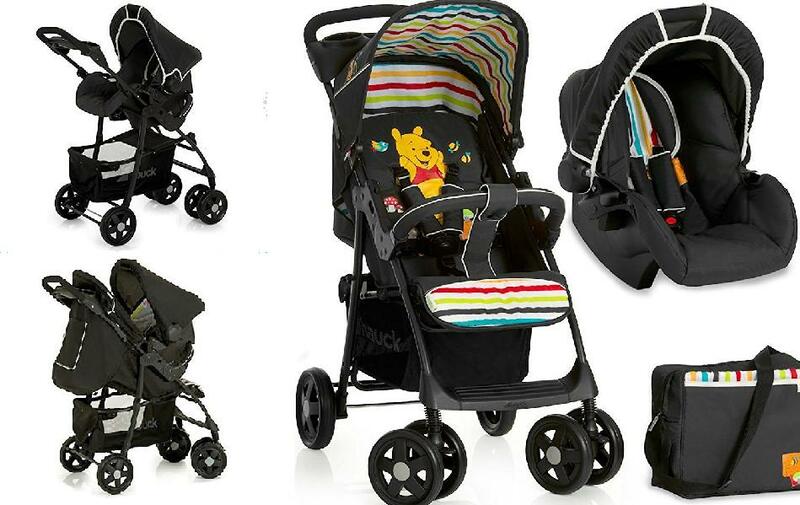 This baby travel system looks great in a combination of black as well as Winnie the Pooh drawing & colours. It comes with a cool range of accessories, some of which you will not find with the higher priced travel systems. To top it off, this unit features a strong steel tube frame that is designed to be lightweight yet sturdy and has large wheels that aid in maneuverability. Let’s take a detailed look at what the travels system offers. Whether you’re walking down a bumpy driveway or on a crowded street, pushing the Hauck Disney Winnie the Pooh Tidytime pushchair will not be a problem. You will have the 4-wheel lightweight base to thank for that, which facilitates good stability on rough terrain. The featured large wheels also help the unit move smoothly over uneven ground while a shock-absorbing suspension ensures an even smoother ride. 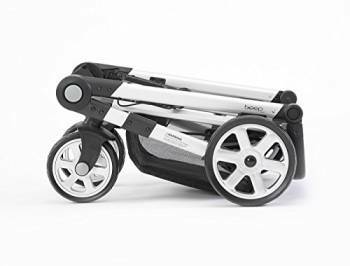 The travel system goes on to include lockable swivel front wheels that make it possible to turn corners, change direction, and maneuver through obstacles easily. There is also a double-acting locking brake for instances where you have to stop abruptly or park the pushchair. The great thing about this Winnie the Pooh Tidytime travel system is that it saves you a ton of money on baby travel products. Aside from being sold at the very affordable price of under £200 (at the time of writing), it acts as a 3-in-1 unit. The travel system comes with car seat and pushchair base that double up as a carrycot and buggy. This is a great deal considering there are some higher priced units like the Cosatto Giggle 2, which sell their car seats separately. And, the best part is that all 3 travel system settings are designed to keep your baby safe and comfortable. The car seat is a group 0+/13kg unit that has been tested and certified for all vehicles with 3-Point Automatic or Static seat belts. It is made of a robust plastic shell and includes head protector as well as side impact protection for utmost safety. The car seat also features several comfort-enhancing treats, including full shell detachable polystyrene inlay, padded adjustable harness, seat cover, and sun/wind canopy. Suitable right from birth up to 15kg, the carrycot/buggy unit includes 4 different seat positions to ensure a comfortable fit even as your baby grows. As for the rest of the features, you have a 5-point padded harness, bumper bar, adjustable cover, footrest, and a hood that folds or detaches when not needed. With its low price, the most you can expect from this and other budget baby travel systems in terms of accessories is maybe a storage basket and a combo of weather shield, inner pram lining, & footmuff to keep your little one cosy. Well, not only do you get all of that with this Disney travel system, but also a changing bag, which Hauck throws in at no extra cost, plus a parent tray with cup holder that is integrated into the design. The changing bag is not only spacious but also designed to fit everything you will need to keep your baby clean, dry, comfortable, and happy. On the other hand, the parent tray is strategically located on the pushchairs’ handle where you have easy access to it at all times. You can use it to hold your own cold drinks or the baby’s bottle. Both car seat and pram click easily onto pushchair. Equally as good as the Mothercare Journey baby travel system, this Winnie the Pooh Tidytime travel system from Hauck gives you everything you need to travel with your little one right from birth to toddlerhood. This despite costing around £100+ less than the former model (at the time of writing). 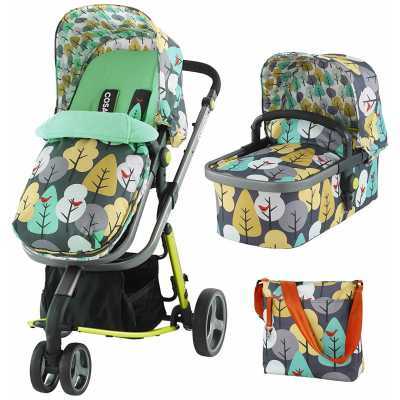 So if you are looking for a budget unit, the New Hauck Winnie the Pooh Tidytime infant travel system is one of the best bargains you can strike. The first thing you will notice about the Cosatto Giggle 2 Travel System ‘Firebird’ is its unusual but friendly looking design. 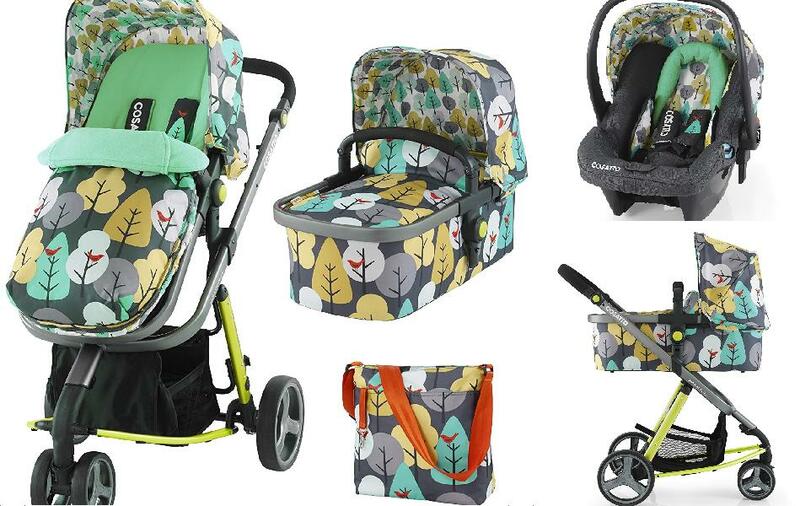 Sporting patterned and colourful ‘tree and bird’ design over the carrycot area and a fun bright yellow chassis frame, the travel system stands out from the crowd and is certainly a welcome break from the monotonous black look that is often seen. Unfortunately, you will also notice the obvious lack of a car seat – despite the unit’s £300+ (at the time of writing) price tag. So, is it wise to buy this travel system when cheaper options like the Mothercare Journey and Hauck Winnie the Pooh Tidytime come with an integrated car seat? Read on to find out more. Despite its light-hearted ‘giggly’ demeanour, the Giggle 2 is designed for serious business. Every inch of the unit is sure to please and it all starts out with a lightweight 3-wheel chassis (only 6.5kg) that is combined with front wheels that swivel to offer you the perfect escape through even the tightest of spots. What’s even better is that you can move as fast as you want over any terrain. All of this is thanks to an all-round suspension system that prevents your baby from feeling any shock during every ride. The hard rubber wheels also mean you will never have to worry about punctures. A carrycot and separate pushchair seat unit add to the exciting design of the Giggle 2. Thoughtfully crafted, the carrycot unit includes a liner and mattress. Additional ‘loops’ underneath a removable UPF 50+ sunshade canopy also allow you to hang toys that will help keep your baby entertained whenever you have to walk over a long distance or know you’re going to be out for a while. The carrycot interior has a soft fabric with a contrasting but equally appealing design. The carrycot can be used from birth until your child gets to weigh 9kgs. Designed for use from 6 months, the seat unit is duo-directional (parent & forward facing). It also adjusts to more than 4 seating positions, ranging from down flat to all the way upright. The seat reclines at the push of a button while a 5-point harness keeps your baby securely in place in all positions. A changing bag is not something you often come across in a baby travel system. This is why the spacious bag (with accompanying accessories) included in the Giggle 2 package is such a delightful surprise. It features the same distinctive design of the carrycot and includes everything you would want in a changing bag. Aside from being fairly large, the bag includes lots of compartments. 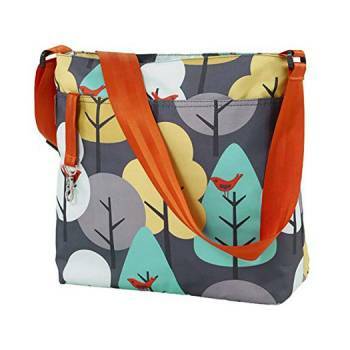 The extra pockets fit in feeding bottles, nappies, a change of baby clothes, wipes, creams, and even your purse. Everything is arranged in an organized manner that makes it easy to reach in and pull whatever you want without scrambling around. Another upside of the changing bag is that it features a long handle that you can simply throw over your shoulder leaving both hands free to push the pushchair. Additional accessories include a changing mat and messy-bag. Therefore, you can change your baby wherever you are and toss the dirty nappy (or clothes) in the messy-bag once you are done. You can also attach your keys on the round keyring found outside of the changing bag. 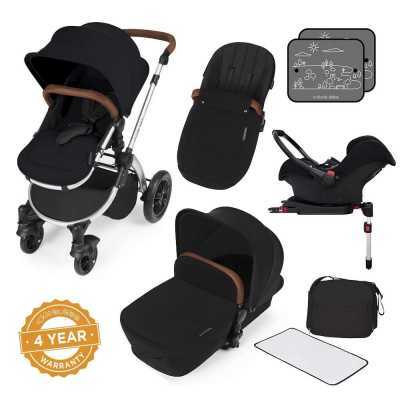 If you are willing to overlook the extra £100+ you will have to spend to buy the Cosatto Hold Car seat and Base that are compatible with this travel system, the Giggle 2 offers some amazing features. 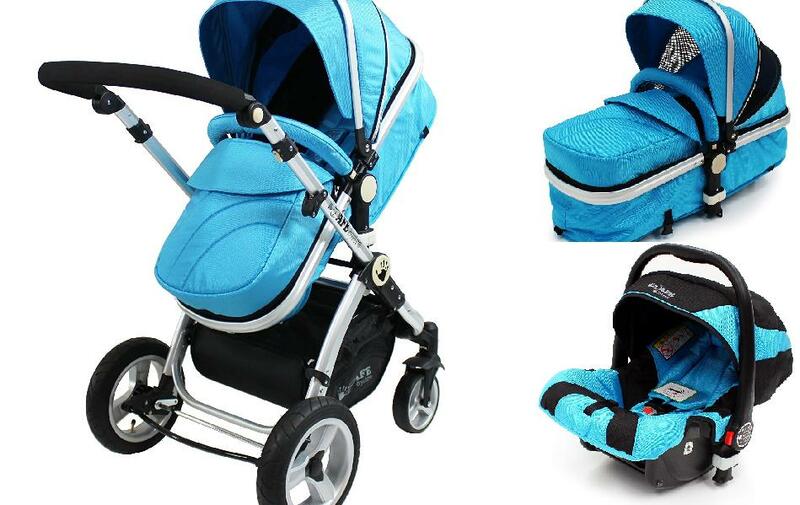 It features one of the best-designed pushchair units around, looks fantastic with all its colours and includes not just a matching changing bag but changing mat & messy bag as well. And with the 4-year guarantee, you are covered against damage for the entire time your child will be using the unit. 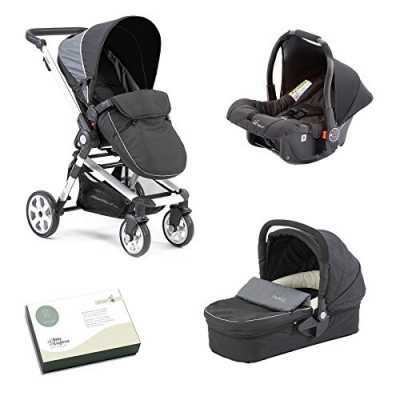 Overall, you get a lot for your money with the Cosatto Giggle 2 Firebird Travel System. A baby travel system consists of a clever combination of a pushchair chassis with detachable car seat attachment. This design eliminates the need for having to lift your baby from the car seat and into a waiting pushchair every time you go out of the house. Instead, you simply pop the car seat with your baby in it from the car onto the travel system (and vice versa) in one easy swoop without disturbing your little one. Why Invest In A Baby Travel System? If you have a baby and are consistently on the go, a car seat and pushchair are among the top items many parents need. 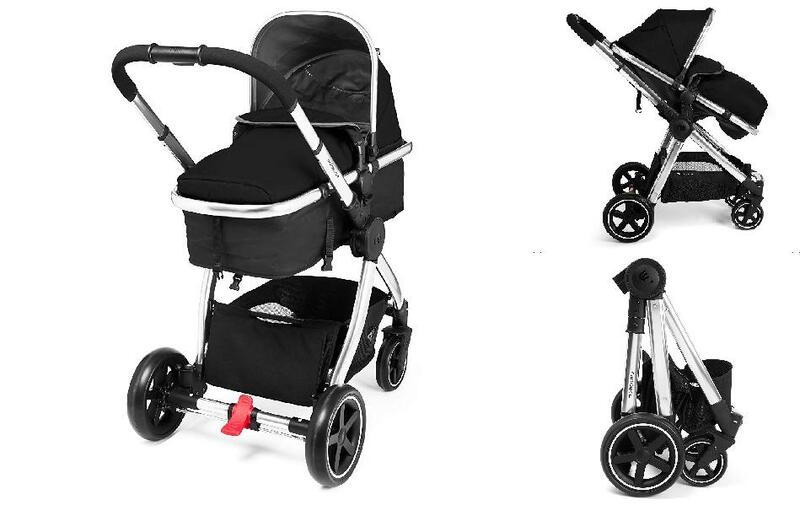 A travel system combines these two accessories saving you from the hassle of having to shop for each piece separately. Plus, the easy car-to-pushchair transfer offered by travel systems comes with some amazing perks. For one, your baby remains strapped in at all times. As a result, you can transport a sleeping baby from the car onto the pushchair without waking them up. Another benefit is that you get to enjoy quick transfer of baby from car to pushchair, because there is no unfastening from the car seat, moving, and fastening your child to the pushchair. If you are in a hurry or are traveling in bad weather, this is a benefit that is sure to please! Travel systems also have the added bonus of being suitable for both newborns and toddlers (and any age in between). This is unlike other options like prams, which are strictly meant for newborns, or many pushchairs that are designed for older babies who can sit up on their own. Although not a lot separates baby travel systems with regards to performance, these car seat/pushchair combo units have slight differences in their designs. These differences give travel systems varying features that appeal to different groups of parents. Here is a list of the different designs available to help you figure out which type of travel system will work for you. If you go out a lot with your child or live in an area with ‘rougher’ terrain (e.g. graveled drive or narrow country paths), a 4-wheeler travel system is a perfect fit. These types of travel systems are known for being the most stable option. They glide smoothly over all terrains (dirt, cobblestones, pavements, etc) making them a good fit for any location. Four-wheel travel systems are also designed to grow with your baby. As such, they are bulkier than other models and tend to include all manner of bells and whistles like extra storage space (for things like a nappy-bag or purse), rain cover, foot muff, and others. 3-wheeled travel systems are designed for families in the city/town where a day out with your baby entails weaving through a sea of people. This model is lightweight, compact, and boasts of easy maneuverability that allows you to move on a pin-head. 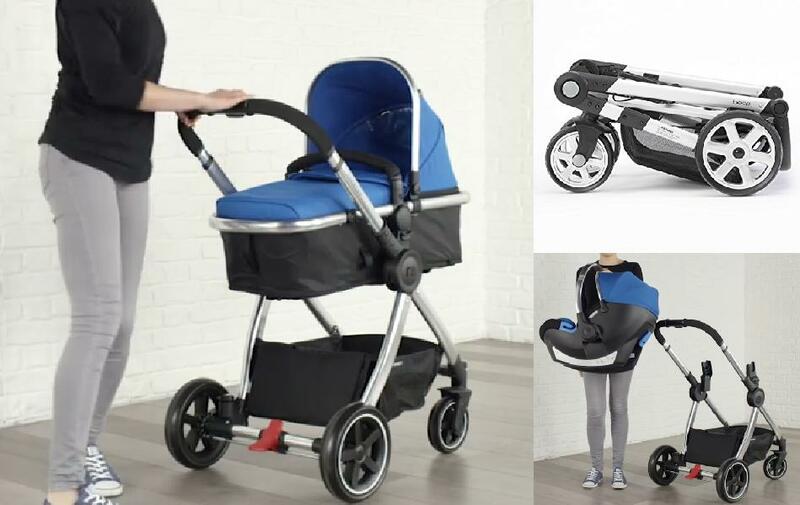 This unique travel system model allows parents who love jogging to bring their baby along for a run. In order to be good at their intended job, jogger travel systems incorporate excellent stability into units that are typically sleeker, slimmer, and lighter than other models including the 3-wheel types. Double travel systems are meant for transporting 2 children at the same time, which can be twins or toddlers of different ages. 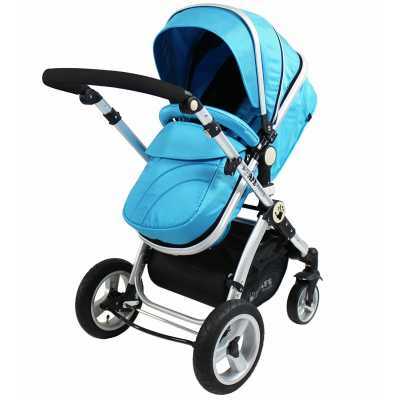 This model features the same sturdy and bulky build as the 4-wheeler version with the difference being that the pushchair features 2 independent sections for car seat attachment. The best part about double travel systems is that they are usually flexible in design and allow you to personalize the unit to fit your specific needs. Because travel systems are typically at least a 2-in-1 unit, they are usually more expensive than other means of baby transportation. However, the amount you end up spending is entirely up to you because there is an option for every budget. With start-up prices of under £200 and a high of over £1000 for those who want to splurge on a travel system, in between is a wide range of models waiting for you to explore. So, it all comes down to what you want in a travel system and how much you are willing to spend. After you have identified the type of travel system that suits the ‘terrain’ in your area and how you plan on using it, any pushchair under your chosen category could be a good fit. However, the same cannot be said for car seats. They come in an array of sizes & types and attach to the car in different ways. For this reason, the very first thing you should do when considering a travel system is to look at the car seat offered. Is it compatible with your car? As per UK law, children have to use a car seat until they get to be 135 cm tall or around age 12, whichever comes first . As a result, car seats come in several groups to suit different weight and age sets. With travel systems, the car seat of choice is group 0 and 0+ units which are built to start off in a rearward facing position (that keeps your baby protected in case of a crash) and later on turned to face forwards. Experts recommend that you maintain the rear-facing position until your baby reaches 13kgs (around 15 months). One downside about group 0 and 0+ baby seats is that they are only meant to serve for a season, with the latter option designed to be used from birth to around 15 months of age, while the former has a lifespan of around 11 months. Once babies outgrow these 2 car seats, they move up to group 1 or i-size (designed to fit in all cars) units. There is also the option of multi-group car seats, which combine 2 different groups to provide a longer lifespan. For example, it is possible to come across a travel system with a multi-group baby car seat labelled as group 0+/1, 0-18kgs. This simply means that the unit is meant to be used from birth until your baby reaches 18Kg – that will be around four years of age. Another thing to look at when shopping for a car seat is how it attaches to the car. A good number click on, some slot on, while others attach via compatible adaptors, which you will most likely have to buy separately at an added cost. Make sure the mode of connection is compatible with your particular car. A popular pick for many parents is Isofix connectors which are made of metal and designed to click together with the vehicle’s car seat and then secured by a third point that can be on any part of the infant car seat such as the seat base. Lastly, when you find a car seat you like, check its dimensions to see if it will fit in your car. Since travel systems are a baby product, safety is paramount. The good news is that all travel systems are generally safe, as there is a set of safety standards that all manufacturers must meet for their products to be released onto the market. That said, the level of safety in a travel unit can differ from one unit to the next. Therefore, it is wise to look at what safety features are included. 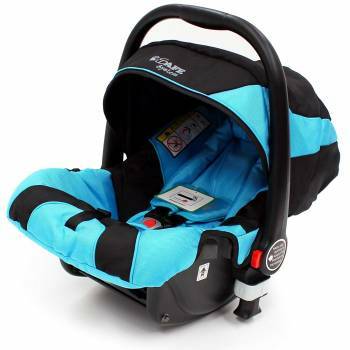 Safety features are normally found on the car seat portion of the unit, but you can come across features like brakes on the pushchair or air-filled or rubber tires that are specially designed to absorb the shock of hitting bumps or moving on uneven surfaces. Other safety features can include things like straps for keeping the baby secured, harness that cradles you child protecting the neck, back, and other delicate body parts from strain or injuries, infant insert for providing additional support and padding for newborns, and so on. A travel system is something you will be using a lot inside and outside the car. So, you’ll want to make sure it is comfortable for both you and your baby. For one-thing, the car seat should feature some form of padding and be spacious enough for your baby to fit with wiggle room to spare. In addition, car seats come in varying weights so choose one that is not too heavy for you to carry. The same goes for a pushchair – moving it should not take up all your strength. If the pushchair has a foldable design, make sure it collapses to a compact size you can carry around and fit into the car without struggling. Travel systems tend to differ in what they offer. Some baby travel systems only feature a car seat attachment while others include an additional carrycot or pram (lie-flat pushchair seat). You can even find some units that do not offer the car seat attachment but only say what car seat(s) they are compatible with, which you would then have to buy separately. Therefore, make sure to check everything that is included before buying to avoid regretting a purchase later on. It is only after knowing every last feature available in a unit that you will be able to determine if it will suit your needs. What Accessories Does A Unit Come With? Accessories are always good to have in a product and travel systems come with tons of options ranging from bumper bars, to a hood, to even a slot for holding a baby bottle (or coffee cup). So, as you check what is included in any model you intend to buy, remember to also look into the available accessories too. Some are a lifesaver while others are convenient to have around. What accessory falls into which category varies from person to person depending on your personal preference as well as how and where you intend to use your travel system. Although baby travel systems are a temporary product you can stretch out the lifespan of a travel system for as long as possible. A convertible car seat, for instance, is designed to take you from day one to the first couple of years of your child’s school life. Similarly, a car seat with a higher weight limit (e.g. 10, 13, or 18 kgs) means you can continue using it even as your baby grows. The materials used and the product warranty can also give you an idea of how long a given travel system unit will last. Travel systems are designed for both newborns and older babies. They are meant to be used in the car and on he streets. So, it is only right that your unit has the flexibility to adjust to your growing baby as well as its different uses. A good example of flexibility in a travel system is a pushchair seat that fully reclines. It allows you the freedom to keep the rearward infant seat facing you with your child in the front of the car and then turn it the other way when your child becomes a little older (e.g. when he/she can sit up unassisted). You can also recline the seat to a flat position when transporting a sleeping baby. The inclusion of an enclosed carrycot, in turn, means you do not have to carry the car seat portion of your travel system when going out on foot. A pushchair with adjustable handles, on the other hand, lends great flexibility to people of different heights. Bottom line; go for a travel system that can grow with your baby and adjust to your needs. From good old-fashioned car seats to strollers, to baby buggies, to prams, the options are many when you are looking for a way to go out and about with your baby. However, none of them delivers the kind of convenience you get from baby travel systems. They prevent you from having to buy separate units for when you are driving, traveling on foot, and carrying your baby from point A to B. This plus being able to move without waking up your baby makes infant travel systems simply priceless. To enjoy these perks, you just need to first identify the type that matches your needs and terrain and then find a car seat and pushchair weight you can handle, compactness you can store easily, and durability that will save you from having to make recurrent purchases. We have included a selection in our roundup above which, we believe, provide a range of included accessories and varied enough in price to suit any budget. As always, we recommend glancing over the comparison table to get a quick and easy overview.